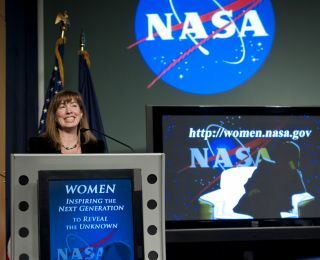 Lori Garver, NASA Deputy Administrator, speaks at a Women's History Month event at NASA Headquarters, Wednesday, March 16, 2011 in Washington. LAS CRUCES, N.M. — For NASA to achieve any of its lofty goals for the future, the commercial space industry must succeed, NASA deputy administrator Lori Garver said. The space agency has bet big that private spaceships will be ready to carry cargo and astronauts to orbit soon. The future of the International Space Station, as well as the future of NASA's robotic science missions and human deep space ambitions, depend on that outcome, Garver said yesterday (Oct. 20) here at the International Symposium for Personal and Commercial Spaceflight. "In order to make good on the entire plan, it is this part of the plan that must be successful," Garver said. After 30 years of carrying astronauts into low-Earth orbit, NASA retired its space shuttle program earlier this year. "Contrary to what you might have heard, that marks the beginning, not the end," Garver said. "With the support of the President and Congress, NASA has made a renewed commitment to human spaceflight." One leg of that commitment is a plan to build a new heavy-lift rocket (called the Space Launch System) and a deep-space crew capsule (called the Multi Purpose Crew Vehicle) to take people first to an asteroid and then on to Mars. NASA and its partners plan to operate the space station through at least 2020, but without the space shuttle, Russia's Soyuz spacecraft is the only means of getting there. Until commercial spacecraft are ready, NASA must rent rides on the Soyuz for its astronauts. For fiscal year 2012, NASA requested $850 million to devote to its Commercial Crew Development Program, which supports the development of these private vehicles. The agency hopes to end its outsourcing to Russia by the year 2016, but "if we don't get full funding in 2012, this is at risk," Garver said. That could prove costly down the line. "One additional year from the Russians will cost us $450 million," she added. The agency gave four private space companies — Blue Origin, Sierra Nevada, SpaceX and Boeing — contracts under the most recent phase of the Commercial Crew Development Program. SpaceX, alone among the group, has already launched a test flight to orbit of its prototype spacecraft. Still, Garver acknowledged that getting the private space industry off the ground isn't easy. "Many of us are frustrated that we have not been able to advance this agenda faster," she said. She also cited resistance from some within the space industry, particularly those who benefitted from NASA's previous contracting methods and now oppose the government turning over the domain of low-Earth orbit to the private sector. "The establishment typically doesn't give away their own power and control readily without a fight," Garver said. Yet the issue is complicated, as many players in the traditional space establishment are the same private companies involved in the new commercial space renaissance. Ultimately, though, Garver said that NASA's encouragement of the commercial space industry will result in lowered costs, greater capabilities, and a more robust American space program overall. "Together we're developing an industry that until recently had largely been science fiction," she said. "We know we can work miracles together."